Strange Lenses distort the faces of pedestrians. The lenses facilitate interactions that make strangers into friends and reduce the anonymous nature of urban environments. It was recently awarded a civic grant to be developed into a two-year public art installation on the streets of San Francisco. With digital fabrication technology, it’s easier to design and manufacture lenses than ever before. We developed a fabrication process makes it easy to prototype optical designs. Read our Instructable for a more in-depth look at our process. It’s not always easy to predict how a given lens will distort an image. To make prototyping easier, we employed ray-tracing software to see how our lenses might distort once fabricated. Our process uses Autodesk T-Splines to create lens geometry, and visualized its effects using Rhinocerous3D and the Neon raytracing renderer. With this technique, we were able to create lenses that achieve a desired effect. 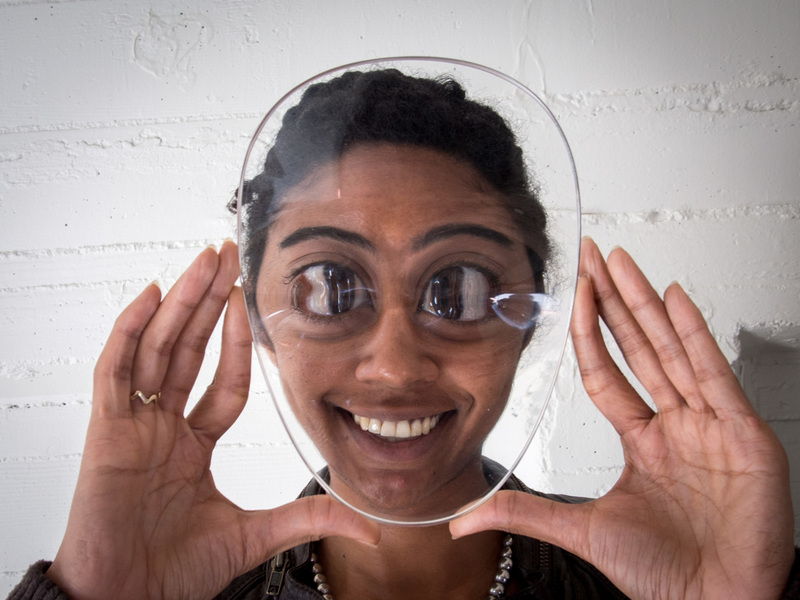 Initially, we used the Objet 3D printers at Autodesk’s Pier 9 Workshop to manufacture the lenses. They were printed with VeroClear resin to achieve transparency. All of the new lenses are milled out of acrylic plastic on a 3-axis CNC router. We are exploring casting lenses in elastic silicone rubber. After printing or milling, all of the lenses were sanded and polished to optical clarity during a 10-hour manual process.